Black and Decker has been constantly developing innovative outdoor power equipment for home owners since 1910. The Black and Decker MM2000 is an environment friendly corded electric lawn mower and is one of Black and Decker’s most selling and successful models. It is budget friendly and boasts of some exceptional features to it’s credit including the 13amp motor, the 20” cutting deck and the 7 height adjustment positions and is also one of the most user friendly machines available in the market. It is more suited to small and medium sized yards up to 1/3rd of an acre in size. 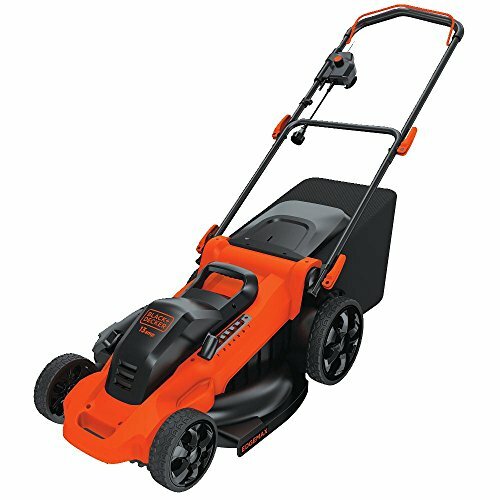 With the usual black and orange colors attributed to its design this push behind lawn mower is light in weight (53lbs) and measures 34.88” x 16.81” x 21.88”. Most part of the body including the cutting deck is made of durable plastic. You do not need to worry about the durability of the product as this plastic body is sturdy and corrosion resistant and is also responsible for the light weight of the mower. The compact corded electric lawn mower has a 20” wide cutting deck deck and a deck height adjustment lever on the left side of the deck. The single point height adjustment lever can be adjusted to 7 different positions between 1.5” and 4”. The corded Black and Decker lawn mower has an ergonomically designed foldable handle that can be adjusted according to the height of the operator and can be collapsed on the mower deck during storage. The push button for starting the lawn mower is located on this handle. It also has a handle bar that engages the deck blades when depressed. The Black and Decker MM2000 has rugged plastic wheels with treads, a flat side deck with Edge Max technology and a convenient carry on handle on top of the deck. The Black and Decker MM2000 is equipped with all three modes of clippings management including a large 13 gallon capacity bag, a side discharge cover and a mulch plug. The corded lawn mower doe not come with an extension cord which has to be purchased separately. The Black and Decker MM2000 is backed by a two year limited warranty from the manufacturer. The light weight of this corded lawn mower is responsible for its portability. The mower can be easily carried along to the place where you want to use it or back to the storage space using the plastic handle on top of the deck. The light weight also enables easy maneuvering of the push behind mower. The long adjustable ergonomic handle with a comfortable grip and the rugged wheels contribute to the maneuverability of the mower. The mower can not only be moved along in flat terrains but can easily work up obstacles or be moved uphill. The cord may pose a problem if you are using a corded mower for the first time. You need to be extra cautious so that the cord is not damaged by running over it. There is a limitation with corded mowers I.e your mowing is restricted to the length of the cord. The handle of the lawn mower can be adjusted in accordance with the height of the operator. This takes off any strain from the operator’s back and enables easy mowing. The handle can also be folded to collapse on the mower deck so that it can be stored in a compact form without utilising much space. Starting the Black and Decker MM2000 is pretty simple. You need to plug the mower to an electric outlet through the extension cord, push the start button and then engage the handle bar to start with your mowing job.The 13 amp motor is extremely powerful and can aid in doing the job with ease. The 20” wide cutting deck is accompanied with a razor sharp blade that makes precise cuts and even tall rough grass or crab grass can be tackled with ease. The flat side deck with the Edge Max technology enables you to go right up to the edge of the walls or fence. The height of the deck can be easily adjusted using the single lever on the side. You can set up the deck at seven pre-determined positions between 1.5” and 4”. The Black and Decker MM2000 offers three modes of clippings management. You can either bag them or mulch them or side discharge them. Engaging the mulching plug will result in the clippings being diced or chopped into finer pieces which are then disposed off into the ground so that they decompose easily providing nutrients for the grass. The bag has a large 13 gallon space which need not be emptied constantly. It can be easily removed from the mower unit and emptied when necessary. We have already mentioned before that this is an environment friendly mower. The mower does not emit harmful fumes that cause environmental hazards. You do not have to worry about any sound that may disturb your neighbors as this is a quiet mower and does not make any sound. The mower also does not contribute to the overall carbon footprint of the household. Maintenance of the Black and Decker MM2000 is pretty simple. You need to clean the blades on a regular basis just after the mowing is done and the blades need occasional sharpening. There are no extensive maintenance methods needed for this mower. If you have a yard that measures less than 1/3rd of an acre this can be the ideal choice as it can almost tackle everything thrown at it. The budget friendly and environment friendly corded electric mower also give you options in the way you want to manage the clippings and is a versatile compact machine that can be stored easily. We can well understand now why the Black and Decker MM2000 is one of the best selling electric lawn mowers from Black and Decker.